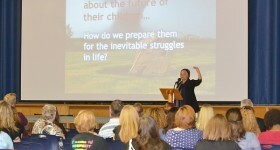 A standing ovation and teary eyes said it all at the 76th Annual Ontario Association for Parents in Catholic Education (OAPCE) conference and AGM in Pembroke on Saturday May 30. In keeping with the conference theme, “Poor No More,” two grade 11 students from Bishop Smith Catholic High School spoke about the annual Dominican Republic Experience to help children and families living in poverty. Alexanna Hawkins and Zoe Ruddy received a standing ovation for their presentation. Later in the day, Kyle Gleason’s kindergarten class from St. Francis of Assisi in Petawawa sang during the Mass and Commissioning by Father Bill Kenney. “They were so good… When they all recited The Lord’s Prayer, there were tears in the eyes of many,” says Lisa Cuypers, RCCDSB Parent Involvement Committee member and conference organizer. Cuypers was very pleased with the turnout, noting it was the first time for the conference to be hosted in Renfrew County. Of more than 100 participants in attendance, approximately half were local residents, with the remainder coming from as far away as Thunder Bay and other areas such as Niagara, Sudbury, Kingston and Ottawa. “Participants enjoyed a great networking opportunity Friday evening, meeting new people from other regions,” notes Cuypers. In addition to dignitaries and special guests who were in attendance, video greetings were received from the Honourable Liz Sandals, Minister of Education, and Marc Kielburger, co-founder of both Free the Children and Me to We, added Cuypers. Twenty-four vendors were also on hand offering information or showcasing opportunities and ideas to enhance school fundraising efforts. Keynote speaker Sherry Campbell, Psychotherapist, captured the audience’s attention with her insights into raising resilient children in the morning session. In the afternoon, Genevieve Gallant, Development and Peace, focused on the conference theme with her talk about reasons, choices, and motivation to get children involved in social justice initiatives. At the evening Gala Awards Dinner, Bob Michaud, RCCDSB Chair said, “I think that perhaps the greatest gift that we can give our students, as educators and as parents, is a concern for others and a commitment to improving the world around them, as they become responsible citizens of our communities.